Behold: My first column as a non-full-time employee of the KJ, and third tire problem in 18 months. Unfortunately it’s an entirely true story, and it comes as I now only have one job and thus don’t want to fork out for a new tire again. Goddamnit. By the time I hit Leighton Road, approaching the office, I was doing 40mph and it was barely noticeable, but there was still some sort of foreign sound there. A noise that I really wish I could ignore but thankfully – for my safety’s sake, if not my sanity’s – I can’t. Lo and behold, a cursory inspection revealed exactly what I expected to find. 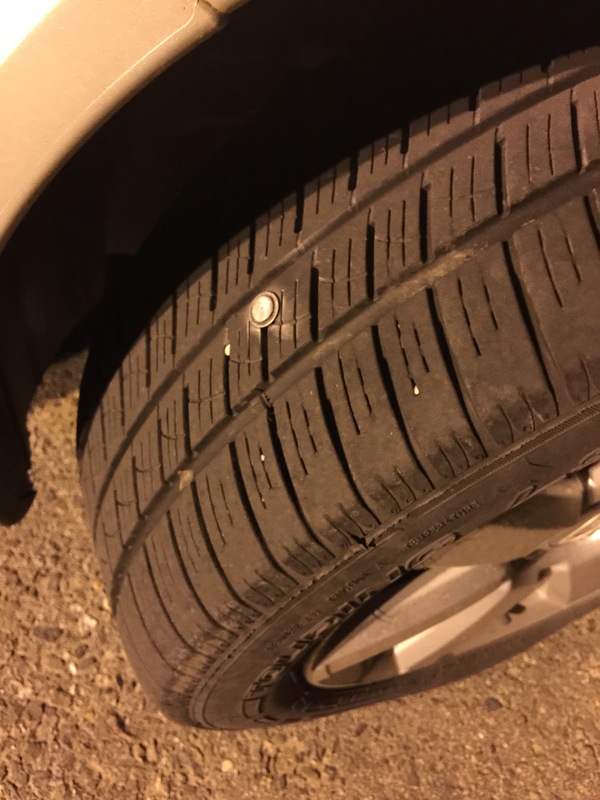 A great big screw embedded in my front-left tire. This will be the third one I’ve had to replace in 18 months. I should have seen the first one coming a mile off. Less than a week after finally earning my Maine driver’s license and purchasing a car, I looked down at the pavement while I was pumping gas one freezing February night to see that the car was sitting on three wheels and on black rubber pancake. The right-side rear tire was as flat as a tack. Coming from a subtropical climate where winter nights rarely get below 40 degrees, one learns a lot about himself and his tolerance for cold weather when changing a tire at 11:00 p.m. when it’s 16°F outside. Upon further inspection of the tire, it was diagnosed as having been split along the sidewall when driving through a pothole. I could only recall one location where that could’ve happened in the past five days, and I vowed to never take Mt. Vernon Avenue on the way to work again. That was a $140 lesson learned. One of my biggest concerns, when I moved here in the dead of winter 2013, was learning how to drive in icy and snowy conditions. Every day, and every degree of change in the temperature, brought about a new surface to navigate, both on foot and behind the wheel. But for all my worrying about sliding off a snowy carriageway and damaging the vehicle that I still owe Maine State Credit Union more than a few bucks for, springtime roads seem to have caused me (or the trusty Subaru, at least) just as much grief. You see, what I didn’t anticipate or know anything about is how roads react to such changing climates. Don’t get me wrong: coworkers had mentioned it to me a handful of times over the winter as they drove me to work, and tried to adequately explain what a frost heave was. But experiencing them from behind the wheel turned a whole other barrel of laughs. And by laughs, I mean pained grimaces akin to having a tooth removed. Through my eye socket. One day, I turned a corner off Western Ave. in Augusta – right there by the post office – and cursed right out loud. I thought I’d driven nose-first into the Grand Canyon, such was the nature of the pothole in front of me. As last spring turned into last summer, and the roads began to smooth out thanks to tireless (no pun intended) efforts from public works crews around the state, I thought my luck had turned around. I made it through the warmer months without having to visit the dealership to inquire about the price of tires for 17-inch wheels. I spent a few weeks pumping air into it on a regular basis in a desperate attempt to stave off another unexpected tire purchase, but to no avail. I managed to have it patched when I took the car in for an oil change; a reprieve for my bank account, because who’s got a penny to spare around the holidays? And now it appears that it’s time for another replacement. My girlfriend’s father spent over 30 years selling tires, and I’m one of those customers who doesn’t even need the sales pitch. I need new ones like clockwork, or so it seems. I guess now that the weather is warming up, I could take the road less traveled and walk where I can instead of drive. Burn calories instead of gasoline, and all that. But if a pothole can do that sort of consistent damage to a car tire, imagine what could happen to my feet?